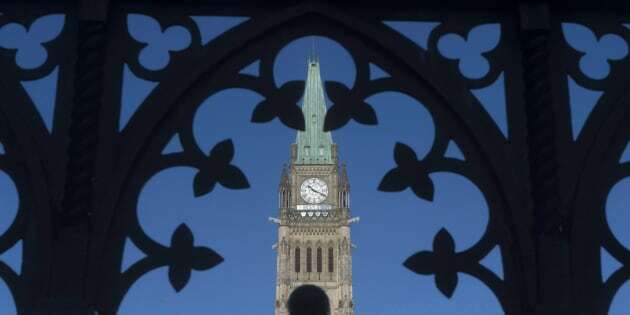 The Peace Tower is framed through a gate on Parliament Hill in Ottawa on Jan. 21, 2016. OTTAWA — In an effort to prevent Canadian charities from becoming U.S.-style super PACs, HuffPost Canada has learned, the federal government may strip the status of some registered charities while it lifts all limits on the amount of non-partisan political activity institutions can engage in. Two officials, who would only speak on condition of anonymity, told HuffPost that the Liberal government may, for example, repeal Canada Without Poverty's status as it develops a new test to ensure that registered charities don't engage solely in political activism. That small charity shares ideas on combating poverty through education and advocacy but does not provide aid to the needy. It was set to lose its registration status when the Canada Revenue Agency deemed in 2015, after years of audits, that the group spent 98.5 per cent of its time engaging in political activity, albeit non-partisan. Canada Without Poverty responded by taking the government to court, arguing that the CRA rule that prevents charities from devoting more than 10 per cent of their resources to political activities violated their Charter right to freedom of expression. This July, an Ontario Superior Court judge agreed, saying the charity should be allowed to "engage in unimpaired public policy advocacy toward its charitable purpose" and that the government had "no justification" to infringe on that right. Justice Ed Morgan struck down the law and ordered that charities be allowed "without quantum limitation" to participate in political activity as long as it is remained non-partisan. On Wednesday, HuffPost broke the news that the Liberals would appeal the decision while, at the same time, promising to introduce legislation this fall to ensure the judge's overall ruling is respected, so that charities will be allowed to engage in any political activity that doesn't involve supporting or opposing political parties or candidates. One concern — though the Liberals played it down — is that the ruling and the Grits' promised legislation will open the floodgates for Canadian charities to emulate U.S.-style super political action committees' running TV ads and political commentary in between elections. In the United States, conservative groups have built on legal foundations first won by progressives to push their agenda forward using the U.S. Constitution's guarantee of freedom of speech. Since Citizens United v. FEC in 2010, corporations, unions and individuals have been using super PACS to skirt some election financing rules. With PACs, as with Canadian charities, there are no limits on the amount of donations, and unions and corporations as well as individuals can contribute. Toronto lawyer Mark Blumberg, an expert in not-for-profit and charity law, told HuffPost the possibility is not far-fetched that registered charities could be used to accomplish political goals. "When you look at what happened in America, when you allow people to give money to organizations and you say that those organizations should be allowed to have freedom of speech just like individual should have, you may think of it as a freedom of speech but it is not a freedom of speech issue," he said. "It is ultimately about giving tax-deductible money, where certain people who have very strong feelings about certain niche issues can spend unlimited amounts of money on it." While charities, such as the Fraser Institute and the Centre for Policy Alternatives, will still be barred from pure partisan activity, it's not difficult to see how a charity's political activity could help boost or harm a favoured or despised political entity. Blumberg gives the example of setting up a charity devoted to advocating economic freedom in Canada. "Say, I'm against there being a minimum wage, all that sort of stuff. In the end, I can say everything I want to say and mirror the Conservative party's agenda without ever actually saying anything about the Conservative party. I can do the same with the NDP and the same with the Liberals." The lawyer believes that without any contribution limits and with an unrestricted ability to talk about any issue — to campaign against the carbon tax, against abortion, against pipelines — MPs will want to set up their own charities to help get their message across. "Everyone of them will have five charities in the end. They want to have a group expressing a view, there is nothing that is going to stop them." Blumberg said he doesn't think many in the charitable sector will shift their focus — but he predicts a few hundred groups will be set up so rich people with a particular agenda can flood the charity sector with their money. Canada's registered charities are subsidized by the federal treasury; they pay no income tax and provide generous tax credits to their donors. While the average Canadians may receive tax credits worth somewhere around 20 to 45 per cent, wealthy individuals tend to receive a far more generous tax incentive, around 70 per cent, Blumberg noted, because they often give appreciated marketable securities, such as shares in a public companies, for which they pay no capital gains tax. Corporations and unions may give to charities, but they are prohibited from donating to political parties and candidates. Individuals are allowed to give up to only $1,575 to a party yearly and $1,575 in total to any riding associations or candidates. "The charitable sector is very different from the political financing system where there are caps to prevent abuse," Blumberg said. "Now, we have just opened everything up completely, where we are almost encouraging people who are wanting to have a big influence in society and who were capped by the political system in a number of different ways to basically flood the charitable sector with money.... The question is do we really want to subsidize what is ... in the end, going to be 100 people's views? That is really what it is." Charities currently view the ruling and the Liberals' promise in a positive light, Blumberg said, because they think if they are allowed to engage in political activity, they will increase their impact. "But they are not looking at the negative of it. The charities that are currently doing zero political activity will probably be doing zero political activity in five years and the people who are going to take advantage are a few hundred super wealthy people, and they are going to have a field day with this." The two government officials HuffPost spoke with suggested Blumberg's comments were extreme. They minimized the financial incentives, incorrectly stating that individuals would receive only a 20 per cent tax credit. They argued it would be more advantageous for wealthy people to use their companies to write off donations to a not-for-profit rather than to give to a charity. "When oil companies decided to fund Ethical Oil so that it could develop a media campaign, that money was 100 per cent deductible," one official said. "Rich people are not going to go to the trouble of creating a charity to get a 20 per cent personal tax credit.... The Canadian fiscal system makes it so it makes no sense to use a charitable organization to promote a super PAC or anything like that." When pressed, the officials said the Liberals do plan to develop a new test to ensure that charities are not established with the sole purpose of engaging in political advocacy. "What we announced is that we were removing the quantitative limits [the 10 per cent cap on political activity] but there are still going to be limits to the type of political activity," he said. "We will need a test to define political activities ... [because] engaging in political activity is not a charitable activity." National Revenue Minister Diane Lebouthillier stands during question period in the House of Commons on Sept. 21, 2017. Charities are defined under common law as falling into four categories: relieving poverty, advancing education, advancing religion, and other purposes beneficial to the community. Environmental groups and organizations that work for the elderly, for example, fall into this last example. Since Canada Without Poverty was found to have spent the vast majority of its time engaging in political activity, the government official said that "with the new criteria, we will have to see whether they're accepted" as a charity. The Liberals pointed to an expert panel report from 2017, which called for charities to engage in unlimited non-partisan political activity — such as educating, advocating, communicating and mobilizing — but recommended they continue to operate exclusively for charitable purposes and that political activity be clearly stated as not a charitable purpose. The panel also recommended that the government remove the prohibition on "indirect" support for a political party or candidate for public office, saying it was too subjective. Canadian charities who want to engage politically during a writ period will be bound by the Canada Elections Act — but only, under the current rules, if they run advertising during the campaign that takes a position on an issue associated with a party or a candidate. Charities, like all third parties, would be allowed to spend a maximum of $211,200 on advertising for a 37-day election period and no more than $4,224 in one particular electoral district. The Liberal government introduced legislation last spring that would raise that threshold but include more activities under the cap. If passed, the law would let third parties spend up to $500,000 during the writ period and no more than $4,000 per electoral district on advertising, election surveys and its activities. The two summer months before the fixed fall election would also see activities restricted. After June 30, spending on activities by third parties would be capped at $1 million, and $10,000 in any one riding — including election expenses. If, however, charities do not engage in activities that are easily tied to any particular political party or campaign, they would fall outside the rules. They could spend unlimited amounts of money before, during, or after an election campaign championing whatever views they care about.